Iceland was formed from volcanic eruptions on the Mid-Atlantic ridge. Iceland was formed for about 24 million years. Iceland is the only place where you can stand on the ridge on dry land. That makes Iceland very special and a popular place for geologists to visit and do their researches. The ridge separates the Eurasia and the American systems which are always going further away from each other. And that can trigger volcanoes or earthquakes. That, along with the hot spot that is under Iceland, makes the country highly active in volcanic activities. The hotspot is probably the reason for the island’s existence because the ridge alone could not have made such a large island. But if Iceland had only been formed by the hot spot it would like a lot similar to the Hawaiian islands. 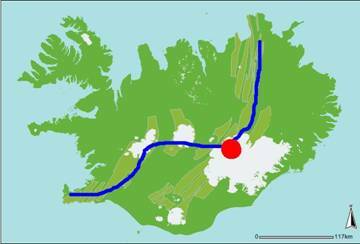 The hot spot is now situated under Vatnajökull. As an example of Iceland's extreme volcanic activity, 1/3 of the magma that has erupted on the earth for the last 10.000 years came up in Iceland. And that is pretty much for such a small country. In Iceland, a volcano erupts every four years in average. The last eruption was in Grímsvötn on glacier Vatnajökull in the beginning of last November (2004). But that was only a small eruption. But we could see the smoke from it from our school. Apart from the Mid-Atlantic ridge there are other fracture zones. You can see the fracture zones and the position of the Mid-Atlantic ridge on the picture above. The picture on the left is copied from the Icelandic weather web page www.vedur.is. The red dot is a mark for the hot spot and the blue line is the Mid-Atlantic ridge. The fracture zones are beside the Mid-Atlantic ridge in North and East. In Iceland there are a lot of volcanoes (as maybe mentioned before). Some of them are greater and more famous than the others. Most of them are situated on the Mid-Atlantic Ridge but some of them are on the fracture zones. The most famous volcano in Iceland, and one of the most famous in the world, is Hekla. Hekla is situated in the south of Iceland. Hekla has erupted 20 times since Iceland was settled and the last time she erupted was in the year 2000. (Picture copied from www.south.is/hekla.html). 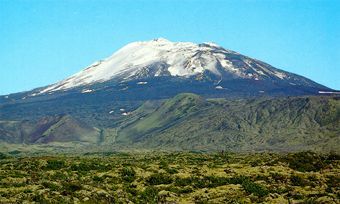 Although Hekla is the most famous, the most active one is Grímsvötn. Grímsvötn is situated in the middle of the Vatnajökull glacier. And as was mentioned before, Grímsvötn last time erupted in November 2004. Apart from Grímsvötn there are a lot of other volcanoes under Vatnajökull glacier. In Grímsvötn there is the most geothermal area in Iceland. And it is under the glacier. With every eruption in Grímsvötn there follows a glacier burst that comes out in the rivers that lie out from the glacier to the south coast of Iceland. Can you see now why Iceland is called the land of fire and ice? It is also interesting that in the neighbourhood of Reykjavík and the Reykjanes, where the majority of all people in Iceland (almost 200.000 people) live there are at least 5 volcanic systems with series of volcanoes that can all still erupt. And if we ought to calculate all the people in Iceland who live 50km or closer to a volcano system we would be dealing with a lot larger number. Iceland is widely known for its many glaciers. Some, if not most people have heard that the largest glacier in Europe is there. It is called Vatnajökull glacier (Water glacier). Iceland also has some other large glaciers like Langjökull (Long glacier), Hofsjökull (Temple glacier), Mýrdalsjökull (Swamp Valley Glacier), Drangajökull (Pillar of rock Glacier) and some other smaller glaciers. 11% of the whole country is covered with glaciers. Glaciers form where more snow snows in the winter than can melt in the summer, so the existence of glaciers depends in the temperature. Vatnajökull glacier, along with most of the other larger glaciers began to form about 2500 years ago. It began as little glaciers on three mountain peaks and slowly united with each other. There are five icecaps in Iceland, Vatnajökull, Langjökull, Hofsjökull, Mýrdalsjökull and Drangajökull. From them some smaller glaciers “crawl” (glacier tongues). For a long period of time they can form valleys and fjords. If Vatnajökull glacier would be swept away in an instant it would only form again on the highest mountains if the weather would be similar as it is for a long time. On the other hand, the land under the glacier and near it would arise a lot. The area under the center of it would rise about 100 meters and about 50 meters under the edges. The area where we live in and the school is located in would rise about 20 meters and in 50 kilometers distance, the land would rise less than 5 meters. But that scenario would be very unlikely. Some people believe that a scenario like that would have great influence on volcanoes under the glacier and lead to an era of a lot of volcanic activity where some volcanoes that are under it now could erupt at the same time. Under most of the glacier tongues that come from Vatnajökull are large valleys. The largest of them are the valleys under Skeiðarárjökull (Spoon river glacier), where there are sometimes huge glacier floods, and Breiðamerkurjökull (Wide field glacier) where the famous glacier lagoon is. Now we are going to talk a bit about that lagoon. Around the millennium between the 19th and the 20th century the glacier almost reached the ocean. But for the next fifty years, the glacier pulled back and formed a lagoon. Now, the glacier pulls back almost 100 meters per year. The lagoon is about 100 meters deep but the depth increases according to the back pulling. 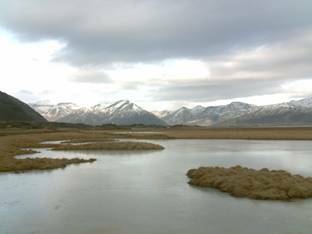 Now, the lagoon is a huge tourist attraction and a man who lives in Höfn runs a restaurant there along with sailing tours on the lagoon. 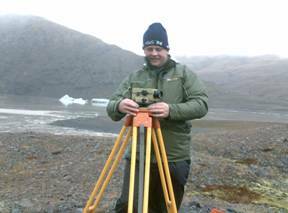 Glaciers can be measured with triangular calculation using a very special monocular. Some students in the school went to measure one of the glacier tongues nearby and the headmaster came to. Here is a picture of him working the monocular. In Iceland, a lot of earthquakes occur every day. You can see a map where the earthquakes of the last 48 hours have occurred in Iceland on the Icelandic weather page. The last two large earthquakes occurred in Iceland in the year 2000. They were between 6,5 and 7 on Richter scale. Earthquakes in Iceland don’t go over 7 on Richter scale because of some unknown reason.